Daytime. A train is out of control. Hundreds of people are in mortal danger. They are probably all going to die. Well...no... no they are not. Why? Because Superman is on it! Story - 5: This is the issue I've been waiting to read. I purposefully held off skipping ahead to this issue. I was hoping beyond hope that it wouldn't disappoint and be worth the wait. Well, I am happy to say that it MOST DEFINITELY was worth it! It's your typical Superman story. Again, this is all by design due to the fact that they aren't setting up a book, but just giving us a tease for the movie. What makes this so good, in my opinion, is that while we are seeing Superman and what actions he takes to save the people on the train, we also get a glimpse into what he must think about when making a save of this magnitude. We sometimes forget how smart he is, as most of his stories tend to fall on the physical side of the coin. But Superman is extremely smart. Something that isn't shown all that often, and is always a welcome change when it is shown to the reader as a reminder. 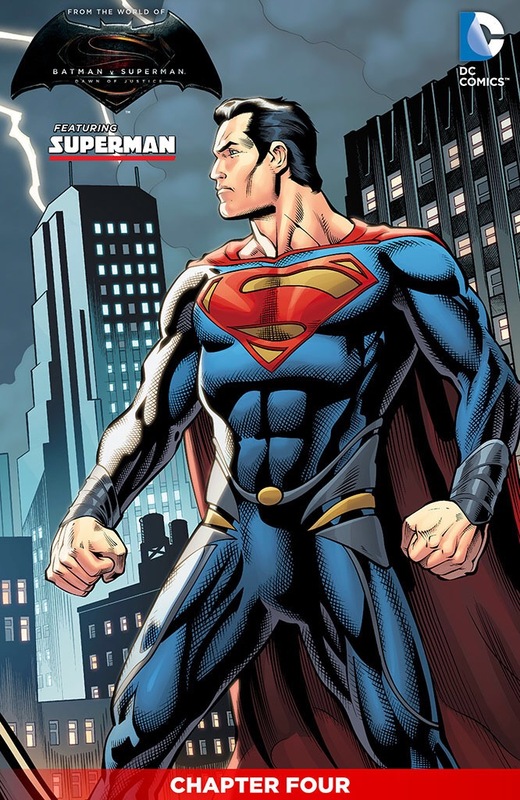 Those writers that tend to write Superman with his intelligence being a main asset are the ones that "GET" the character and how he should be depicted, in my not so humble opinion. I'm really hoping they show this intelligence in Batman v Superman. The first half of this story nails how I want to see my Superman in action. The action is so well drawn that it really seems like we are watching this scene in live action. So much so, that I actually hope they do something similar at some point in the movies. As good as the first is, the second half is more than its equal. But for entirely different reasons. You would expect that a book titled "Superman" would see its quality suffer when the main character disappears during its entire second half. Well, you would be wrong. What this issue does is lay out the entire plot of Batman v Superman. It's been mentioned in the previous chapters, but it's really driven home in this issue. We see that it's not that his detractors don't view him as a hero, or appreciate what he is doing for the people of Earth. No. We see that they truly fear his power. Something Batman will take to the 100th degree, judging by the trailer. The internet fan arguments/debates that sprung up from Man of Steel are mentioned. In the second half of this chapter during an actual debate/argument, Superman's lack of saving people during the "Battle of Metropolis" is mentioned. With one character representing the side "for" Superman saying he saved all that he could, and the other side saying they disagree with that assessment. This is exactly what went on after that film's release in the forums of the Superman Homepage and many other websites. Except, maybe a bit more colorfully...lol. Those that worried that their side of the argument would get the shaft, as Snyder blew them off to make up excuses, need not worry. While we can't be sure by going off of these prequel comics, it sounds like they are going to address both viewpoints with well thought out arguments. In this chapter the discussion is more about - What if Superman decides he's had enough of our wars? What do we do? What CAN we do, if anything? I won't go into the discussion in this review, as I want you guys to form your own opinions based on the story itself. For me though? If this was real, and Superman were to show up in our world, the "worried" side (so to speak) is probably where I would fall. Shocking... I know. You all know my love for Man of Steel. So for me to say this, you know that it must be a well thought out debate that is shown in this story. A debate that is clearly being orchestrated by Lex Luthor I might add, as he once again shows up at the end of this chapter. This is definitely making me more excited for Batman v Superman. I think we will all find something to enjoy. Even those that didn't like Man of Steel for the reasons they are addressing in this issue might find the film's response enough to give them "hope". Which is appropriate because as we all know...It's not an "S". On his world it means "Hope". Final Thoughts: I know it seems that I am being overly kind to this series, but they are really well written and drawn. They are extremely entertaining. Could I nitpick them to death? Of course, but that's not what I do when I watch a movie or TV show. So, my reviews follow the same line of thinking. I would love to see this team continue the story after the movie is released to bridge the gap until The Justice League: Part One. Next up? Lex Luthor! Art - 5: The second panel of this issue shows Superman flying. It's the classic pose. With the fist outstretched and Superman giving his look of determination. Joe Bennett and Sean Parson are really doing some great work. Superman looks like Henry in this issue, which is something I was worried about as I tend to hate it when they are drawing to a specific actor as Superman and completely miss (I'm looking at you Smallville: Season 11). The rest of the issue is just spot on. I've been a fan of this team's art work through the entire series, and this issue doesn't disappoint. Cover Art - 5: Excellent Cover image once again after a so-so Chapter Three cover. We see another classic Superman pose. This time he's standing, ready for battle in a city that looks like Gotham, but I can't be sure. The suit looks better here than it does on the big screen, which will make those that aren't a fan of the color tone of Man of Steel very happy.